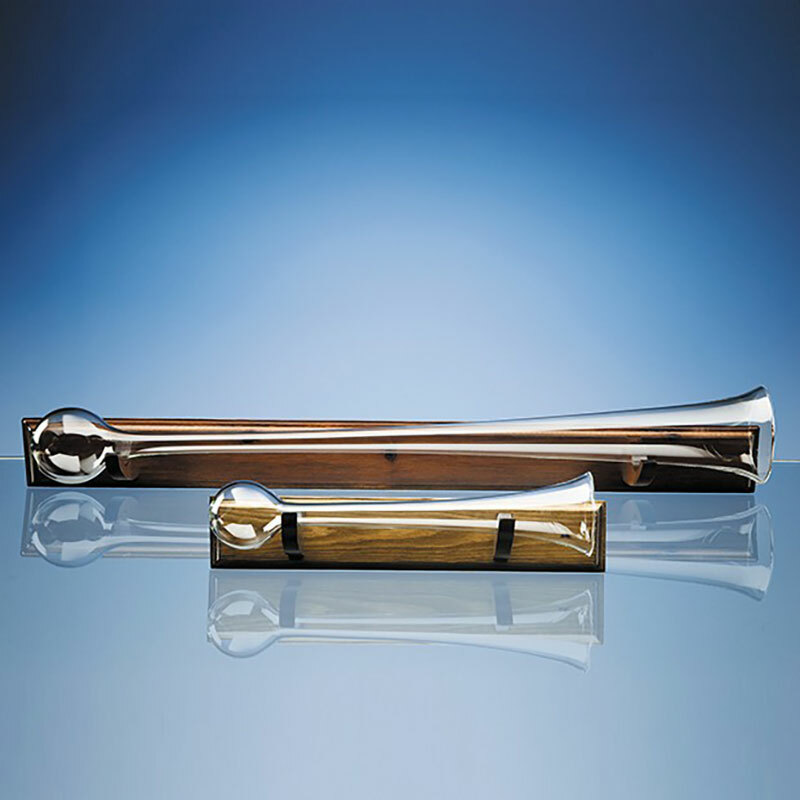 Yard of ale glass on wooden base, a traditional drinking gift crafted in quality glass and offered with low-cost engraving. Ideal as corporate gifts, 21st birthday gifts or retirement gifts. The Yard of Ale glass is a traditional English beer vessel with origins dating from at least the 17th century. It has a distinctive shape with a bulb at the bottom and a narrow stem opening out to a wide mouth. It has long been associated with toasting ceremonies and drinking games as the bulb design at the base means that once raised the glass cannot be rested. Typically when not in use, the Yard of Ale glass is stored on a wall on a wooden base or stand. The wood base offered with these glasses is ideal for wall-mounting. The fine quality Yard of Ale glass and Half Yard of Ale glass offered here can be engraved to create unique gifts or ceremonial drinking glasses, and they are offered with low-cost engraving of text and logos. As well as corporate gifts or awards, or sporting gifts (the Yard of Ale makes an ideal rugby gift), these long glasses are also perfect as commemorative gifts for 'coming of age' landmarks such as 18th birthday gifts or 21st birthday gifts. They are also popular as retirement gifts too.